At some point, it’s something every avid reader puts on their bucket list. I’m going to join a book club! we tell ourselves. But so often, book club night goes the way of that early morning yoga class or that junior college Painting 101. Even though it’s something we enjoy, it becomes a chore. We feel guilty when we don’t finish the book in time; some go so far as to scramble to read the last chapter right before the club meeting so they can pretend they finished. But what if book club could be something you only looked forward to, something low pressure and non-guilt-inducing? What if book club was simply a celebration of books with like-minded people? What if book club didn’t come around every four weeks like clockwork, somehow miraculously conflicting with Johnny’s soccer game or your evening Skype meeting every single time? I’m going to do a series of posts over the next four seasons to offer my remedy for this book lover-plaguing problem: seasonal guides to an unconventional book club. Er, book party!Each season’s club party will revolve around a book most or all of the members have read. This could be anything you can all agree on but for the purposes of these guides, I’ll be working with classics as there’s a good chance most of you have read them! For summer, I’ve chosen a perennial favorite of book lovers everywhere: Sherlock Holmes. So how exactly should you spend this Summer Sherlock Soiree? And what shall you do at your book club, if not sit around with a predetermined list of questions to discuss? Certainly, you’re sure to debate the merits of Irene Adler’s many incarnations and Moriarty’s redeemability and whether Mary and John were really right for each other or not. But why not also introduce some fun activities to the evening as well? Print off the Sherlock BBC themed background paper for this adorable silhouette project from The Nerdy Girlie and see what fun, crafty twists everyone comes up with. You have the drinks, the food and the entertainment. Now all you need are guests! 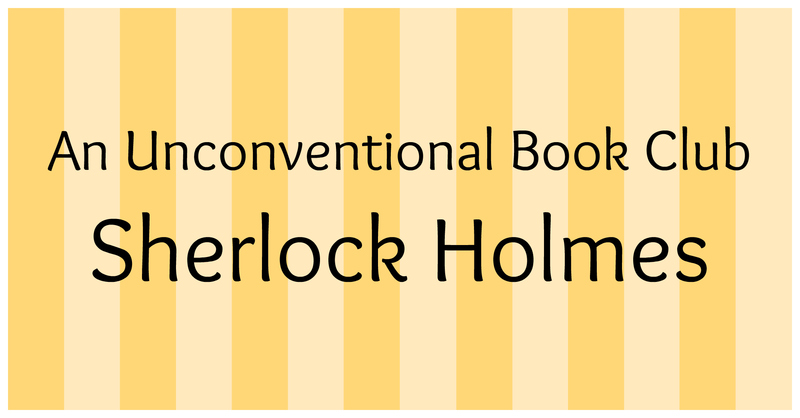 Invite your closest Sherlock-loving friends to this fantastic book club party that’s sure to be so much more than just elementary.